The Bangor Campus hosted it’s HVAC Open House and Advisory Meeting on the evening of October 22nd. Jim LeBrecque, of Maine Alternative Comfort, Joe Mishou of Fire and ICE Heating and Air Conditioning, Jason Barnes with AE Robinson, Josh Van Trump, Ryan Mitchell, Butch Osborne of Osborne’s Heating and Plumbing, and Dan Oliver, of Oliver’s Plumbing and Heating were in attendance. Q106 radio host, Cindy Campbell, was on the air with a live remote to speak with students and companies alike. Butch Osborne spoke on behalf of NTI and his very positive experience with hiring NTI HVAC graduates. 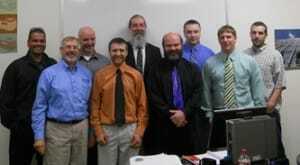 Current HVAC students, who graduate this month, stepped it up by “dressing for success”. The students had a great opportunity to visit with companies, provide resumes, and find out more about the HVAC industry.